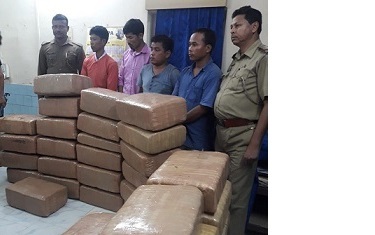 On a tip-off, the East Agartala Police in Tripura on Wednesday seized a huge consignment of dry marijuana (ganja), weighing 900 kg, in sealed packets, meant for smuggling in Mohiskhola area on the outskirts of State capital, Agartala. The recovery of the narcotics is the part of a special drive against drugs which was launched by the State Government two months back, said Sub-Divisional Police Officer (SDPO) Suman Majumder. Majumder also said four persons have been detained by the police for transporting the consignment of 45 packets of dry marijuana, the market price of which would be around Rs 25 lakh. The consignment was seized along with a car. “Interrogation is on to trace the kingpin,” said Majumder. A case has been registered under Narcotic Drugs and Psychotropic Substances Act (NDPS) Act, 1985. The newly-formed BJP-led Government in Tripura declared that it wanted to make the State drugs free besides it expressed its concern about the smuggling of drugs as Bangladesh has raised this issue at various levels. For the last two months, Tripura Police and Border Security Force (BSF) have been making continuous efforts to curb smuggling of drugs to Bangladesh. The BSF along with the State administration of Tripura recently have seized huge quantity of Yuba tablets, brown sugar besides dry marijuana and also destroyed marijuana plantations in the bordering areas. Four northeastern States – Tripura, Meghalaya, Mizoram and Assam – share a 1,880-km international border with Bangladesh, some parts of which still remain unfenced making it porous and vulnerable.